Maru Buendia-Senties will be presented with the Visionary Award by the Sor Juana Festival: A tribute to Mexican Women April 11th, 2010 at the Mexican American Cultural Center. 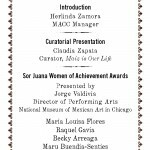 In 1994, The National Museum of Mexican Art inaugurated the Sor Juana Festival, the first festival ever dedicated to Mexican women. Through the Festival we honor the legacy of one of Mexico’s greatest writers, Sor Juana Inés de la Cruz, and pay tribute to the rich artistic accomplishments of Mexicanas from Mexico and the United States. The festival features: culinary arts, dance, film, literature, music, theater and visual arts. Today, the Sor Juana Festival is the largest multidisciplinary festival in the United States dedicated to Mexican women and has expanded beyond Chicago. The Festival is now also celebrated in Austin, Dallas, Fort Worth, Houston, Milwaukee and San Antonio and has won praise by media, both Latino and non-Latino. Through the Sor Juana Festival the National Museum of Mexican Art has established groundbreaking partnerships and developed a network of cultural institutions dedicated to presenting and promoting Mexicana artists from both sides of the border. The network is a resource for Mexican/Mexican American artists and helps cultivate an awareness and appreciation of performing these artists on a national level.